So today ended up being a 2nd rest day this week for me *gasp*. I can't recall the last time this has occurred actually. I just didn't have it in me to get up this morning to attempt anything. I was secretly hoping to get in a run, but I slept terribly for starters and my legs are oddly sore this morning. Tonight will be Pizza Friday (duh), so I won't have a recipe and I don't have a workout, so I thought I'd talk briefly about something I was thinking about and discussing with friends over the past few days. With the Operation Beautiful: Transforming the Way You See Yourself One Post-it Note at a Time book hitting the shelves, there has been even more discussion in the blogosphere about learning to love ourselves for who we are. I'll admit to being overly self-critical. I won't even pretend that I'm not. I now have a post-it on my mirror, "Love Yourself" to help keep myself in check when I start to point out a flaw each morning. That brings me to this idea: do we ever look at our friends and say ugly things to them like, "Girl, I can't believe you haven't gotten that nose of yours fixed," "Honey your ears are too freaking big for your head," "Man you've packed on some weight, look at that jiggle." If we do, then we probably don't have many friends. My nickname growing up was Grace and not because I posses any. On any given day I knock my shoulder into a doorway at least once (probably many more that I just don't even remember). I broke my tail bone in the 7th grade slipping on the stairs at our house with pizza in one hand and soda in the other - saved the pizza thank you very much. I severely sprained an ankle falling out of a chair - I was seated...and sober. I got a concussion roller blading 3 years ago. I have a scar on my hand from a 2nd (or close to 3rd) degree burn from my toaster oven back in December - Jason bought me some special tongs that I must always use now in addition to an oven mitt. Your turn - tell me some of your klutziest moves! Yes, this is SO true! We're so supportive and loving of our friends, so forgiving of their faults and excited by their successes, but we rarely give ourselves the same treatment! I bet you'll feel ready to go after 2 rest days. It's true I really do need to start looking at the positives. I happen to jump in front of a car once. That was dumb. I run into walls all the time...in my own house! I have had a piano fall on my foot and it crushed my big toe (exploded) and the two toes next to that. I can't tell you how many times I fell when I was pregnant...seriously, I am 5'2" so a basket ball on the front of me was not good design! Just this morning, while making coffee, I shook the almond milk...after I took the top off. Really, I am the worst...it is just sad. Hahaha! I love these facts! Ooh I've broken my tailbone before too... NOT fun! 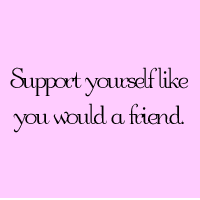 And I love that saying about supporting yourself. I think we all need that reminder from time to time! I still have gravel in my knees from a roller blading incident 10 years ago. I was going down a huge hill towards a four way stop and remembered I didn't know how to break. I used a no parking sign and my knees as breaks (no knee pads). It's so important to love yourself, I work on it everyday, the reward has been amazing. Hope you enjoyed your Pizza Friday! LOVE your new slogan!! I might have to "borrow" that one!! Hmm.. I'm the complete klutz, so there are a ton. One that has lasted with me is that I tripped while carrying a tray of chicken nuggets back to my table at camp about 15 years ago.. so embarrassing!! #2 the shoulder/door knock...OMG THAT IS ME!!!! and also my hipbone. I come around corners at warp speed multitasking and then end up hurting myself...omg ALL The time!! I have bruises all over me! i truly am my own best friend. after high school i didnt stay in contact with my friends. most of them i realized were not the type of people i wanted to be around. and being in a small city is harder for me because a lot of people here have 'Big' personalities and are very judgy and 'its all about me' attitude which is really sad. but there are a few great people ive talked with and hopefully will meet more when im taking yoga teacher training. for now its just me, myself, and i ... and the fam. I have run into a doorway before - ouch! I am so clumsy, which is why I prefer sports/activities that don't involve hand-eye coordination. I not so soberly fell off of a one foot ledge and broke my hand at a sushi restaurant. Pure class. I'm a klutz too, I poured boiling water all over my hand once when I was making coffee.. just completely missed the cup, I'm still not sure how! I hear ya. I think it traveling take a toll on your body so you need that extra day off. You'll be ready to go again next week. I am a klutz too. I've broken my arm/elbow 2x, fallen down stair, bruised my tailbone, and so far I'm still alive. Phew! That is SO TRUE!! We'd never say, wow, girl, you look chunky in those pants! But to ourselves, we're so mean. At least I am to myself far too often! Good point, and thank you for that, I needed it today after a rest day and a day where I ate cake and other goodies and have a severe food hangover! Funny. You do, indeed, sound like a klutz. :) I have not had any bad injuries such as these (well, I did just cut my finger with a knife recently - it felt like it hit bone...I went to the doctor, but they didn't do anything...it still doesn't feel quite right, and I think I've ruined my finger forever) but I do have terrible peripheral vision. I constantly hit my shoulders on doorways, etc.